Sometimes, life doesn’t turn out the way we expect it to. However, when push comes to shove, we’ve all got to pull on everything we have to do what’s right… as well as to unravel the mysteries we stumble upon, and solve the crimes that form shadows in the darkest parts of our cities. 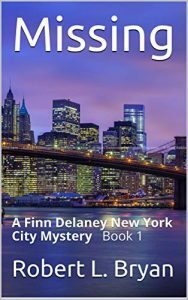 In Missing, private detective Finn Delaney leads us through a tale of danger, darkness, and corruption, and he seems to be way, way, way off the course he expected to find himself on. We’re taken on a journey into a spiderweb of international crime, and through the murkiest corners of New York City. Finn is a man who had his hopes, dreams, and family tradition of police work snatched from him, and who has to deal with his lot the best way he can. We follow his journey into the world of private eye detecting, and feel his frustration at not following the previous four generations of his family into the NYPD. However, things quickly take a turn for the surprising… and we’re taken on a roller coaster ride of dark turns and shocking twists. Finn’s lack of enthusiasm for his new job as a private detective is palpable. In over his head, out of his depth, and totally lacking experience, the shock that Finn gets when a vast, sprawling case lands in his lap is a truly thrilling one. With a price on his head, and the flood level of murderous danger and revenge constantly rising, Finn works his way through the network of lies and peril, and finds his calling as a PI. With a missing girl, some dodgy cops, and a case which continues to become more than it first appears, Finn Delaney has more on his plate than he expected. With the clock ticking, and a personal vendetta against him, can this frustrated detective solve the mystery? Or will it take him to places he might not be ready to face, and challenge the pride his family had always held in the NYPD? Make no mistake, this is a crime novel for today’s discerning reader, and with its undercurrents of suspicious communities, endemic police corruption, and plenty of dynamic comic relief (especially in the form of Finn Delaney’s best friend, Kevin), it zips along at a breakneck pace that will keep even the most jaded reader on the edge of their seat. Robert L. Bryan was born in Queens, New York, and has been a life long New York City resident. He retired after a twenty year career with the New York City Police Department at the rank of captain, and is currently the chief security officer at a New York State government agency. He is also an adjunct professor in the homeland security department of a NYC college. Robert has written several short self help and security / law enforcement related books. His first full length book, “CONDUCTOR” was inspired by his son’s career choice, and details the history of the railroad conductor profession. His next two books -“C-CASE” and “DARK KNIGHTS” are non-fiction accounts of his experiences with the NYPD. Both books won awards in the 2017 Public Safety Writers Association writing competition. THE LAST DAY, a fictional thriller, won the first place award in the 2018 competition.